All steel construction. Riveted bracket for added strength and flared nail holes for fast take-down. Four nail holes on top double holding power - to prevent separation from rail. Black enamel finish. Great for a variety of uses: home, shop, office, crafts and hobby; rugged co-polymer construction with wide front openings allow for easy access and greater visibility; space saving design allows the bins to be stacked when in use or nested inside each other for storage. Newly redesigned and engineered to satisfy virtually any storage need. Top organizers enable small parts organization. Latch with geometric lock for smooth and easy use. New elegant design with sturdy robust appeal. Pad eye lock, enables to lock the toolbox. Top recesses for screws and washers. 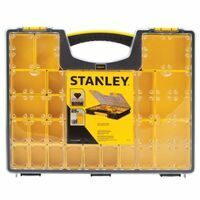 Tool tray with handle and enabled side access for flexible storage solutions.